Church should be a safe place, right? Then why do so many get hurt there? Ray Beeson and Chris Hayward combine their years of ministry experience to address head-on the elephant in the room: church members and church leaders hurt Christians. All the time. And the long-lasting effects—rejection, shame, despair, loneliness, fear—can be devastating. The authors have witnessed the rise of the “dones,” those who are just done with God thanks to scars from church. With first-person stories of hurt and loss, this book is a wake-up call for any who deny woundedness in the church but is also a redemptive message for any who hurt from church wounds. Leaders and laypeople alike will learn how to grieve over abuse, to leave unhealthy attitudes and patterns that cause pain, and to trust in God’s real, delivering work through churches that build up, not tear down. Thanks to the grace of God, there is always hope beyond the pain. 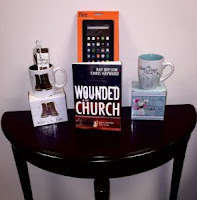 Wounded in the Church is a book that should be read by everyone, not just those who have been hurt by Christians and/or church leaders. Written in a conversational style, the book is split into two parts. The first half, titled “The Pain,” shares personal experiences of the authors and others, and many of the vignettes are difficult to read. It was sad to read about the harm done to people. The second half, titled “The Hope,” shares ways those who have been hurt can find healing. Through the use of Scriptures as well as coping mechanisms offered by those who have risen above their pain, the book offers caring and realistic answers. Other books on the topic are referenced, giving readers additional resources. 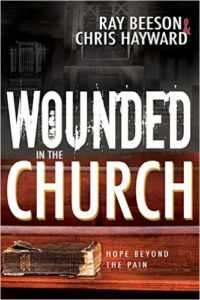 Well-written, Wounded by the Church covers a volatile topic with sensitivity and professionalism. I received this book for free from CelebrateLit Publicity, and a favorable review was not required. All opinions expressed are my own. Ray Beeson is the director of Overcomers Ministries, a teaching ministry with a special emphasis on spiritual warfare and prayer. Ray teaches seminars on spiritual warfare, prayer, and Christlike living and is the author of numerous books including Signed in His Blood (Charisma House, 2014) and The Hidden Price of Greatness (Overcomers, 2000). Ray and his wife, Linda, live in Ventura, CA. Chris Hayward has had over thirty-six years of pastoral ministry and is currently serving as president of Cleansing Stream Ministries, a discipleship ministry that works with the local church around the world. He is also the author of God’s Cleansing Stream (Chosen Books, 2004) and The End of Rejection (Chosen Books, 2007). Chris and his wife, Karen, live in Castaic, CA. When we tell people we’ve written a book entitled “Wounded in the Church,” many nod knowingly. Sadly, the pain and heartache that happens in churches is all too common. Collectively, the two of us have spent more than 70 years in ministry. During that time we have seen neglect, tactlessness, and blatant insensitivity fostered by some leaders and congregations resulting in the wounding of others. We realize it is not prolific in every church, but the wounding is significant and it needs to be exposed. That is why we wrote this book – we share real stories of real people who were wounded in church, a place that should be a shelter of God’s love and peace. Sometimes people are abused by leaders or church members. There are also times when leaders are abused by people within the congregation. As you read, perhaps you’ll identify with some of the situations described. If so, be assured you are not alone. If you have been wounded, it is our hope and prayer God uses this book to facilitate healing. Because of Jesus Christ, there is hope beyond the pain. I would love to read this book. There are so many situations that can happen in the church setting, and this is one that needs to be addressed. Thanks for the review. I agree. This is an "elephant in the room" that is often not handled. Thanks for visiting, Ray. Your book definitely fills a need. As someone who has also been wounded and has a brother in ministry who has been wounded, I found lots of helpful information and insight in your book.